Wartile is maybe not the greatest name for a videogame ever, but I do dig the idea. It's a digital rendition of a hex-based tabletop strategy game, with a diorama-style game board, detailed figurines, and special ability cards, all of it recreated in gorgeous, lightly-animated detail, with single and multiplayer support. Even better, there's a free demo on Steam, so you can try it out for yourself. The demo is pre-alpha build, and thus comes with all the usual caveats about bugs, missing features, and so forth, but for being in such an early state it's actually quite good. 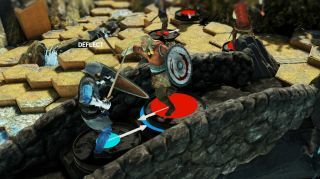 Unexpectedly, given its tabletop roots, Wartile is real-time rather than turn-based, although the pacing (at least in the demo) is fairly languid. A tutorial lays out the basics of how to play, while the demo itself is a single mission that sees a gang of Vikings attempting to loot an English chapel. I made it almost to the very door of the chapel on my first playthrough, but with victory in sight, my sole surviving warrior was surprised by a hulking armored knight, who pasted him soundly with a really big sword. A Viking invasion of England will form the basis of Wartile's single-player campaign, and the Kickstarter pitch makes it sound suitably epic. But I strongly suspect that multiplayer is where the real action will be. Multiplayer boards will be specially designed to "offer a different experience from the Battle Boards and Challenge Boards" of the single-player game, and will support unique modes of "competitive arena" play. The Kickstarter has so far raised a little under £12,000 ($17,000) against a goal of £55,000 ($78,000), with 24 days remaining. A non-Steam demo is available to download from the campaign page, and you can get a closer look at the game at wartile.com.